The assessment of human abilities dates back nearly 4000 years when China used written tests to rate applicants for civil service. Utilizing our knowledge of human behavior to improve lives is probably even older. Most people feel that therapy began with the teachings and discoveries of Sigmund Freud. Until a few short years ago, assessment and therapy were performed in an office setting utilizing face to face interventions and assessment techniques. Innovative ways to apply the theories in psychology are constantly being explored, but the new digital era has brought a vastly different experience to this endeavor. Today their are several ways to get mental health services without ever leaving your home. Basically, there are two types of services offered online, each with varying degrees of interaction: Assessment and Therapy. Online assessment includes self scored tests and quizzes which typically cover a specific area of psychology, such as depression or anxiety. 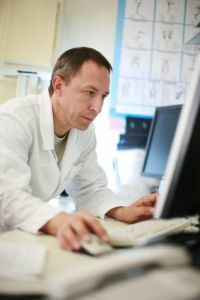 More general online assessment may include mental health screening tests and personality inventories. These are usually longer and more comprehensive. Online therapy ranges from newsgroups where either mental health consumers or consumers and therapists interact. This is a good format for simple advice and support, but falls short when more specific feedback or information is needed. The next tier would be e-mail therapy, where a client actually fills out a form or sends an e-mail with a question. The e-mail is then answered by a mental health professional which allows for more specific information and often a more in-depth analysis of the question. The final tier is what is usually thought of as online therapy, e-therapy, or cyber therapy. It consists of a client and therapist interacting in a chat room in real time. This allows for greater interaction and more specific feedback than the other types. All of these, however, have both their strengths and their shortcomings. The remainder of this article will primarily address online psychotherapy and will give you a basic understanding of strengths, ethical concerns, how to find an online therapist, and how to help assure a positive experience. Online therapy is often less expensive than traditional therapy. Although there is a negative side to privacy, there are no concerns about being seen walking into a therapist’s office, or bumping into a friend as you leave. You can also interact with your therapist without having to take time off of work or make up excuses as to where you are going. One of the strongest arguments against online psychology is that it significantly reduces interpersonal quality. Much of assessment and treatment involves studying posturing, body movement, and voice tone. All of which are impossible in the virtual therapy office. Often times, much of the healing that takes place in therapy comes from the knowledge that someone is listening to and focusing on you exclusively. You gain empathy from warm facial expressions, and gather hope knowing that someone is physically there for you. Privacy and Confidentiality Privacy is both a pro and a con. As many of us are aware, there are plenty of ways to gain access to personal computers, to intercept email, and to hack into a site that is reportedly secure. Many opponents of online therapy argue that this in itself raises a multitude of unresolved concerns. Who benefits from Online Psychology? 1. My schedule is so hectic that keeping the same appointment on a weekly basis would be impossible. 2. I would just like to get some professional advice every now and then and am not seeking any weekly commitment. 3. The thought of calling a therapist, making an appointment, and/or going to his or her office terrifies me. I have thought about therapy on several occasions but have not made the effort to seek help even though I know it would be to my benefit. If you answered true to any item and believe you would benefit from therapy, seeking help from a licensed online therapist may be the best choice for you. This is the million dollar question. There have been no published studies that address the efficacy of online therapy so much of what we know about how well it works comes from providers and clients. In both of these groups you will find those who believe it is very effective and those who believe it can even be harmful. Most agree, however, that if performed ethically and with a full disclosure of the strengths and weaknesses involved, online therapy can be an effective alternative to traditional psychotherapy. As with any treatment for mental health concerns, however, there are never any guarantees. The traditional way to find a therapist is to ask others: friends, family members, physician, minister, priest, rabbi, etc. If this isn’t successful or you don’t feel comfortable doing this, then I would suggest joining a newsgroup devoted to your concerns such as alt.depression (there are many and they are all free). You can ask the group but be prepared to get anywhere from no information at all to more information that you ever wanted. Or do your own internet search (or traditional library search) to make sure all your questions are answered. What Should I know Before I Start Online Therapy? What is your degree (Ph.D., Psy.D., M.S.) and what was your major course of study (psychology, social work, counseling, etc)? What specialties do you have training for (hypnosis, EMDR, etc) and what additional training did you complete to gain these credentials? How long have you been doing online therapy? How is my confidentiality assured? And any other question or concern you have. Remember, you are paying a therapist which means he or she works for you. You have the right to feel safe, confident, and trusting of this person and if you don’t feel all three, or haven’t gotten your questions answered, stop and seek another therapist.